Wow…pure taiji gold! wish I had been there to participate….but so appreciate the opportunity to view an incredible workshop that is brimming over with so much clarity and great visual demonstration of taiji principles at work. An auger is a great image of a rigid spiral that does not move in relation to itself (only rotates in a fixed position) yet it produces a continuous lever and causes displacement due to its shape and rigidity…we have to know how to apply flexibility and stretch and when to lock everything and torque. I could most certainly be wrong but it seems as if movement should only be used to stealthily move into position and must never have any power applied to it. It’s only used to go around the opponents structure adhering to it evenly taking up all the space while setting up your encasement (locking) then all the power (rotational torque) is applied to a very small area making it extremely potent. The demonstrations on peng helped me to realize that proportionality not only refers to length and direction but also evenness in the application of pressure and your use of the small triangle vs the large triangle made it much clearer for me. The leverage produce in the frontal double positive circle is amazing and there is one instance where you can really see what looks like front/back separation. It looks like a small semi circle sliding right inside of a bigger semi circle that lifts the opponent out. Many many other great pieces too. After watching it repeatedly each time I see more and more. Lots of very informative nuances seeing the free pushing too. Fantastic. Thank you! This clears up a few more things. This is a methods video rather than a theoretical explanation video. 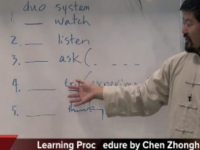 Chen Zhonghua shows how to do the moves with a minimal explanation of the what you are trying to do. The movements are not complex. A good understanding of turning the joints and space and time and the channeling of the forces throughout the body would be useful to get the most out of this workshop video. With that foundation, many gems can be gleaned. Because of that, I would give this video a difficulty rating of 4/5.